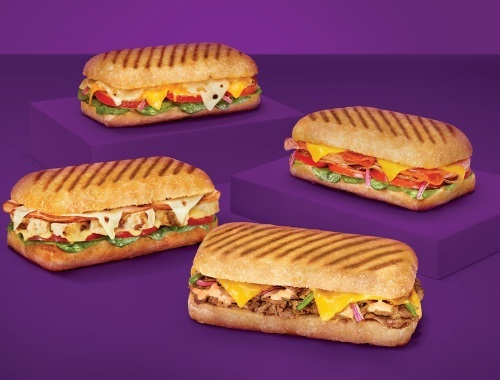 Subway has introduced four paninis on fresh-baked ciabatta bread! Available at participating restuarants across the nation. Chipotle Steak & Cheese: Tender, 100 per cent Canadian steak topped with green peppers, red onions and cheddar cheese that's grilled to perfection on the new ciabatta bread. Triple Cheese: Think comfort food meets cheesy goodness. Cheddar, Swiss and Monterey cheeses are layered with baby spinach, juicy red tomatoes and crunchy red onions. Chicken Cordon Bleu: Layers of Canadian ham, grilled white meat chicken strips and Swiss cheese are topped with baby spinach and tomatoes and drizzled with a creamy honey mustard. Italian B.M.T. Melt: The rich flavours of Genoa salami, pepperoni and ham are layered in warm, melty cheddar cheese, all topped with spinach, tomato and red onion and drizzled with house sandwich sauce. Have you tried these? Let us know on our Facebook Page. Click here to browse Subway.